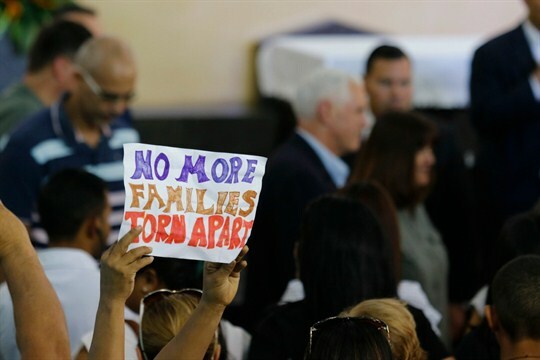 A Venezuelan raises a sign denouncing the separation of families during U.S. Vice President Mike Pence’s visit to the Santa Catarina migrant shelter, Manaus, Brazil, June 27, 2018 (AP photo by Marcio Melo). In the midst of a raging political battle in the United States over President Donald Trump’s unprecedented measures against migrants and asylum-seekers along the southern border, Vice President Mike Pence set out on a tour of Latin America this week. The trip was planned and announced before Trump’s so-called zero tolerance policy against illegal immigration, including forcibly separating children from their parents, turned into a major international news story.